The ultimate holiday – unique, exclusive and private sailing & yachting trips along stunning Mediterranean Sea & The Catalan Coast. From Barcelona & The Costa Brava, to The Baleric Islands & The Costa Del Sol; we’ve got you covered. Browse and book online now. Day trips, weekly charters, onboard dining, special events and personalized itineraries are all here and available for instant online booking. 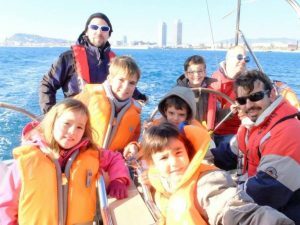 What a wonderful experience – to sail up the Costa Brava above Roses. The whole family enjoyed it immensely. The boat and cabins were beautiful; the views were spectacular; the water was wonderful for swimming; the food was delicious; and the captain and crew were both professional and friendly. Also, the whole experience was carefree – we were completely taken care of from the moment we stepped on the boat. All in all, a wonderful family weekend!